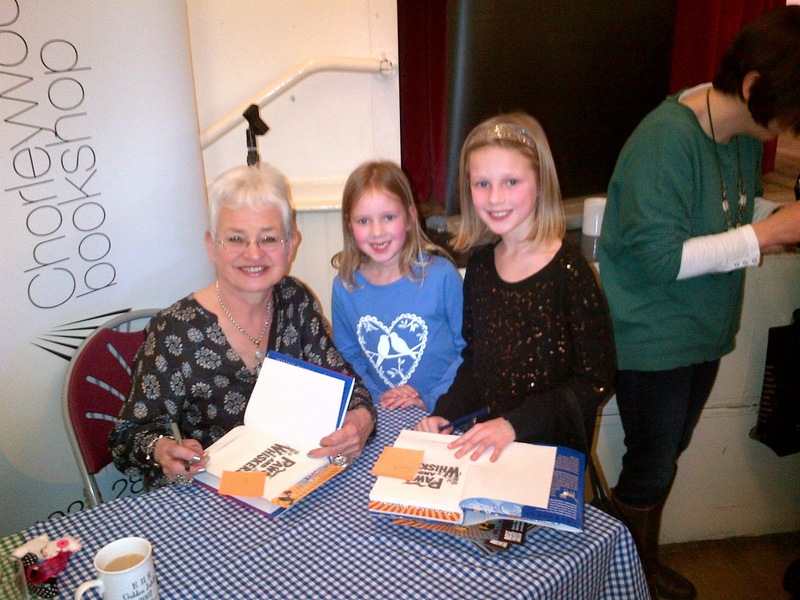 What Lexie Loves: The amazing, the wonderful, the brilliant - it's Dame Jacqueline Wilson!!! The amazing, the wonderful, the brilliant - it's Dame Jacqueline Wilson!!! You may remember a couple of weeks ago I wrote an It's Finally Friday post talking about going to see Jacqueline Wilson, world famous author, well I had a great time and now I'm going to tell you about my great experience. So we arrive in Chorleywood Festival Hall and there's a biggish smallish room filled with chairs. My sister and I find a good enough seat and sit down ready for the talk. Finally my hero is walking on to the stage and a huge applause goes round - it's Jacqueline!! First she talks about how she longed for a pet as a child (like me) and how it finally came true with her cats Jacob and Lily. Then she said about other books of hers with cats in, Queenie for instance, and afterwards she began to talk about her new book Paws and Whiskers. Paws and Whiskers is a collection of short stories or extracts about cats or dogs such as Ice Lolly by Jean Ure and The Theater Cat by Noel Streatfield. My favorite is Leonie's Pet Cat, which is actually by Jackie herself, because it is sweet, a bit sad and quite funny at times. Having listened to the talk a few people were aloud to ask questions - they only asked about 12 out of around 100 children and I was one of the lucky ones able to ask Jacky a question. Making the most of it, I asked her which was her favourite tale out of all of those in Paws and Whiskers. And she said probably Catwings right at the beginning by Ursula K. Le Guin. Which I'm going to be honest here wasn't my favourite. Paws and Whiskers is a great book whether you a fantasy lover, lifestyle reader, horror enjoyer or a comedy needer this book has it ALL. So go to the the shops today and my a copy. I extra specially recommend it to 7-12 year old girls, fans of Jackie. Once we'd collected our book we queued up to get our copy signed and maybe to have a photo. I'd printed off my review of Diamond and she said it was a 'great review' and she signed that as well. Overall I had a fabby day!